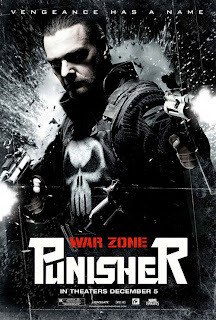 Infamous vigilante, anti-hero Frank Castle (Ray Stevenson) is six years into his vengeance driven zeal as the Punisher when he brutally assaults a "beat the rap" party for notorious mob boss Gaitano Cesare. During the course of the massacre, he hideously disfigures overeager gangster Billy Russoti (Dominic West) and murders a mafia lackey who turns out to be an undercover FBI agent. Agent Paul Budiansky (Colin Salmon), the ex-partner of the undercover Fed, joins the NYPD's "Punisher Task Force" to help bring Castle to justice, once and for all. A facially mutilated Russoti recovers from his run-in with the Punisher with revenge on his mind and recruits a massive army of psychotic killers, gangbangers, and mobsters under his new alias "Jigsaw." Distraught that he has now become the very evil he swore to battle, Castle is content to hang up his guns and quit the justice business for good. However, plans quickly change once he learns that Jigsaw has not only kidnapped the surviving wife and child of the dead federal agent but now has also freed his commited psychopathic brother, James (Doug Hutchison)...aka..."Loony Bin Jim. "Forced back into the war, the Punisher now has to face off against Jigsaw's formidable army in order to save the lives of an innocent family his actions put in the firing line "Clock's ticking."